The Christmas holiday season is almost here and with it comes the pressure of looking for gifts for friends and loved ones. 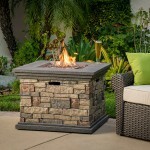 Looking for the perfect gift can sometimes be daunting but if you’re here, then probably your mind is made up and what you’re looking for is the perfect fire pit to give as a gift to someone special. Good for you! That is really a great idea! And you know what, you have come to the right place for some great fire pit ideas. If you’re not here for some fire pit inspiration and you landed here looking for something else, stick around. Since you are already here you may just as well have a look, and maybe this post will help you realize that a fire pit will make a wonderful gift after all! How could it not this winter season? These fire pits are great as they burn clean and smokeless and best of all, they are portable, lightweight and compact yet still functional making them perfect for almost any outdoor living area, small to large. Click on the pictures to shop any of these products. 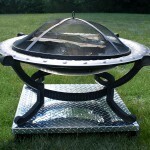 Well, in case you’re looking for the best selling range of portable propane fire pits, the Outland fire pits are it. They are also some of the best rated rated in the market so you can be assured of quality with these ones. 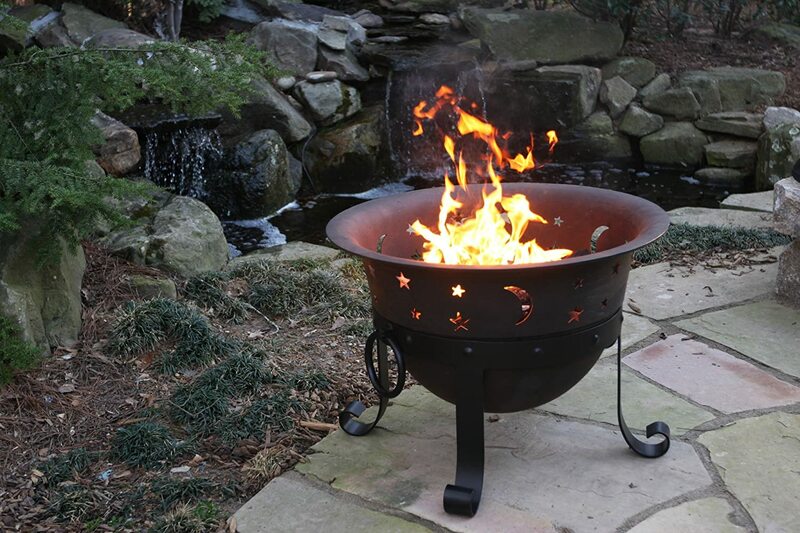 Outland Fire bowl fire pits come in several designs, with their most popular being the Outland Fire bowl Deluxe and Outland Fire Bowl Mega Fire pit, probably because they are larger in size compared to the other designs and still affordable too. So any of these would be our first recommendation if you’re looking the perfect portable propane fire pit gift idea. Auto-ignition system that ensures a fast and simple lighting and a progressive rubber comfort-grip chrome knob for easy lighting and flame height adjustments. They emit up to 58,000 BTUs of heat. They come complete with a cover/carry kit, pre-attached 10 ft. hose with regulator, propane tank stabilizer ring, and decorative rock set. CSA approved for consumer satisfaction and safety of use. They are certified safe to use during most fire bans. Can be converted to natural gas with the help of a their new CSA approved Natural Gas Conversion Kits. 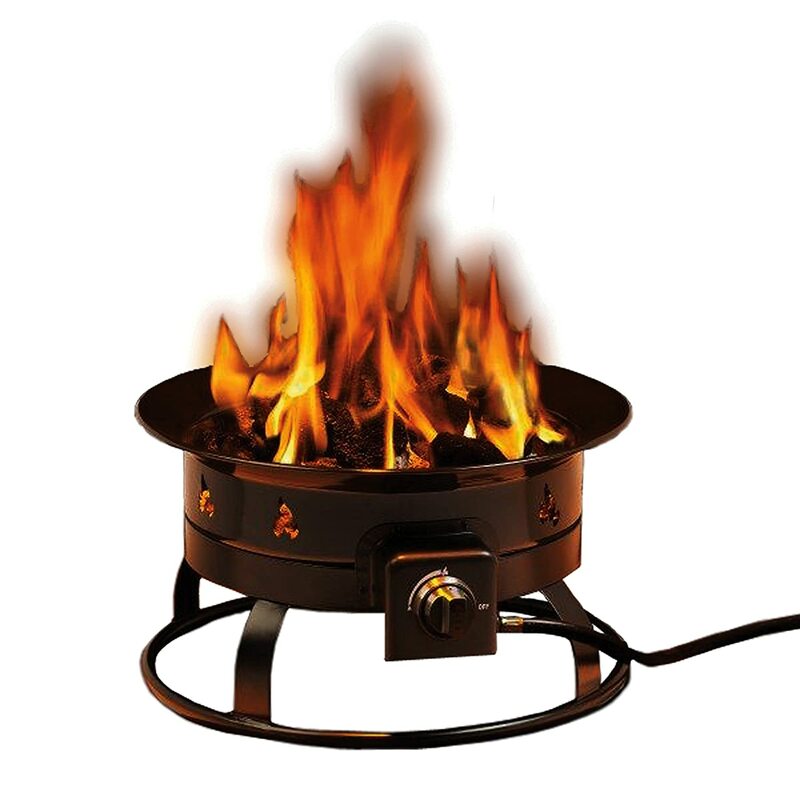 Another portable propane fire pit that would most likely be a great gift for a loved one especially one who loves camping, outdoor gatherings and tailgating is the Heininger Outdoor Fire Pit. 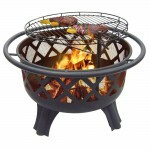 It is the single most popular/best selling and one of the best rated portable fire pits in the market currently. It has over 600 customer reviews on Amazon alone currently. 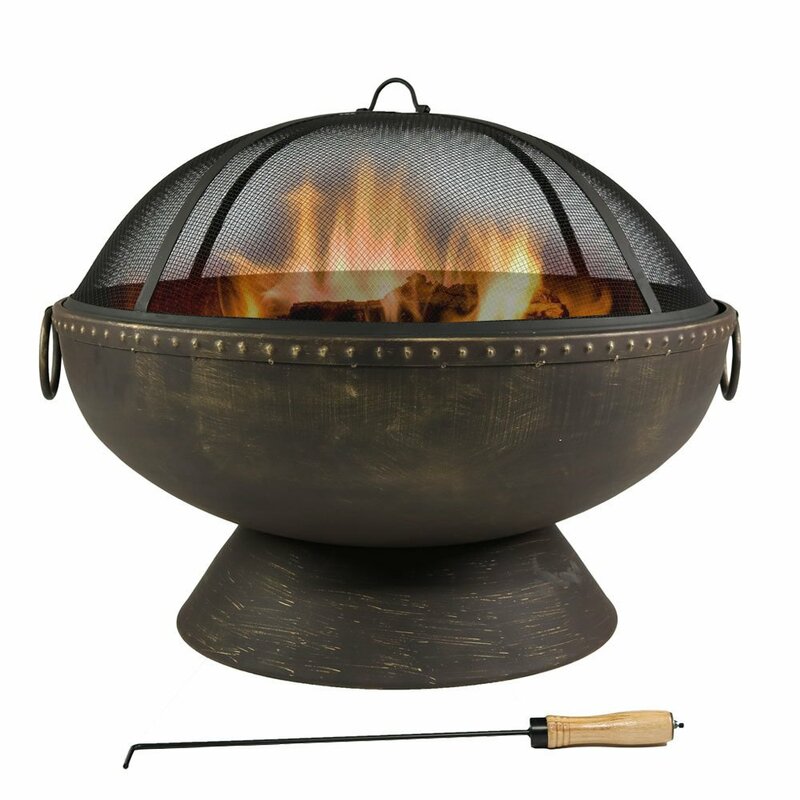 This 19″ diameter all-weather fire pit is lightweight and compact which makes it perfect for backyards, patios, camping or tailgating on the go. 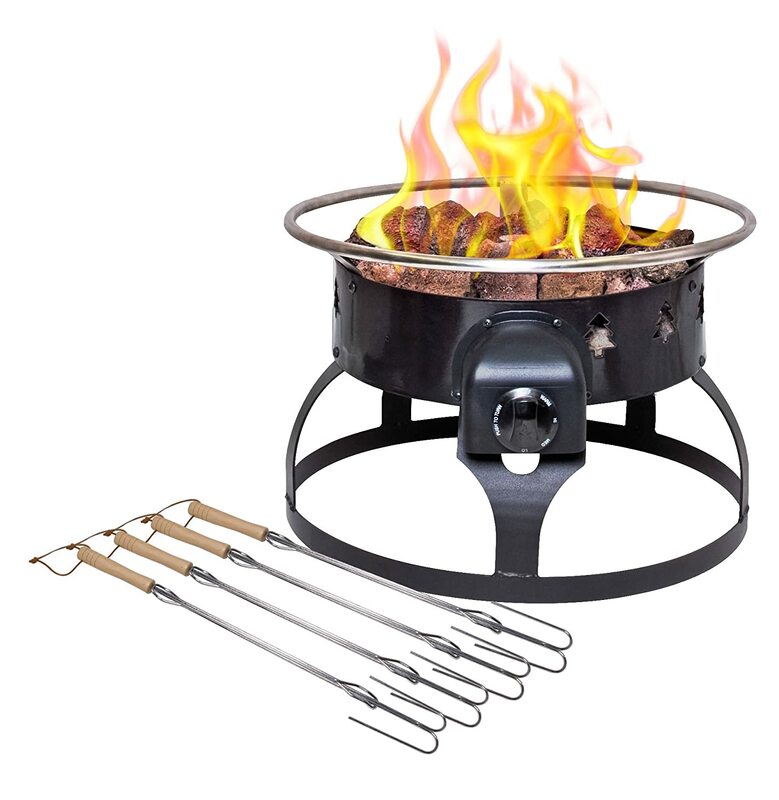 19″ Diameter Camp Chef Redwood Port. 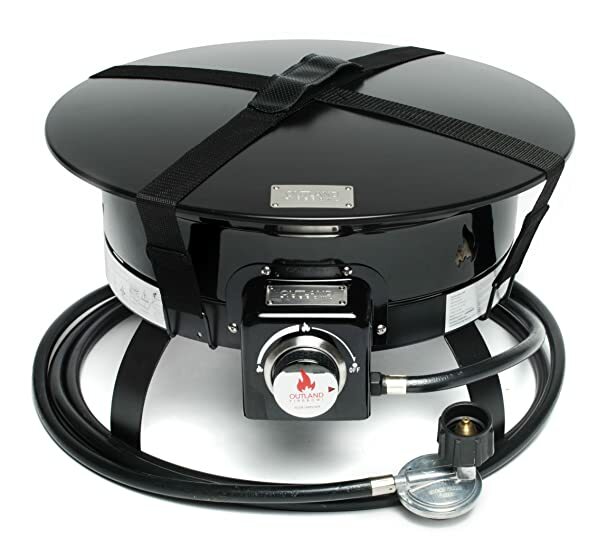 Pro Fire Pit features an effortless matchless ignition system. Heat output of 53,000 BTU/Hr. Comes fitted with a safety shut off valve in case the flames are disrupted suddenly thereby avoiding gas leakages. Also comes with zipper carry bag for easy portability, 4 adjustable roasting sticks for outdoor cooking, assorted lava rocks for accenting the fire pit, bulk tank fitting and a hose. You will get many outdoor metal portable fire pits in the market that are usually low quality and quite frankly, made of some very cheap flimsy metal. However, this one boasts of being “heavy duty” and I will tell you this, it is exactly that! Heavy duty! The star and moon cut-outs bowl is constructed from cast-iron with thicker gauge steel base to ensure years of use. Has a deep bowl which makes it perfect for large fires. Includes a removable 24 in. diameter mesh spark screen to contain flying embers, screen lifting tool, log grate and protective weather cover. Worth noting that since the frame is made from iron, over time if you let it, it will weather to an attractive patina look that blends well with the outdoors. Landmann fire pits are the most popular/best selling and some of the highest rated wood burning portable fire pits in the market which is why this list couldn’t be complete without them. 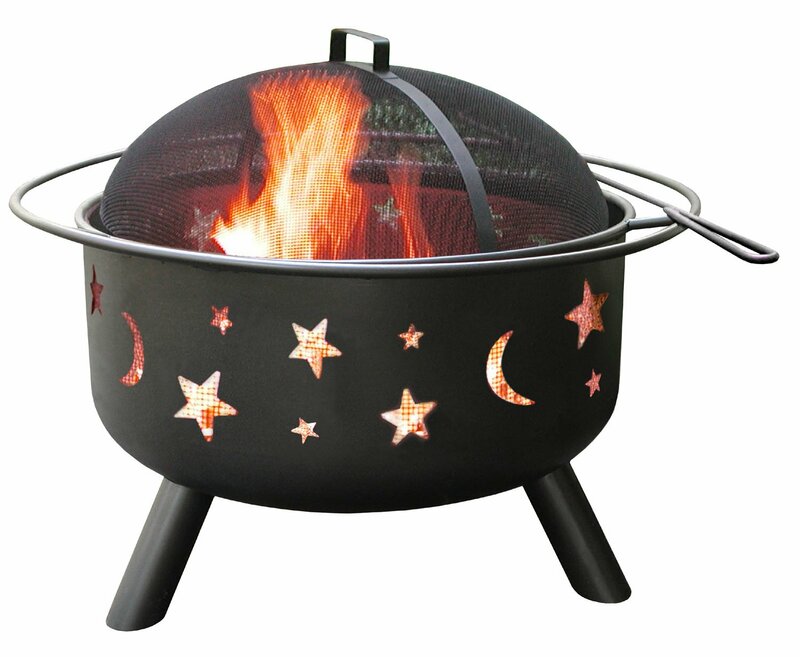 Landmann fire pits usually feature cut-outs of the bowl frame from night time sky features- stars and moons design cutouts to wildlife cutouts that glow for a great fire views. They are made with sturdy steel with various protective weather-proof finishes. They usually feature a safety ring for easy transport and come in different bowl sizes. They come with a spark screen, poker and some designs may include a cooking grate. 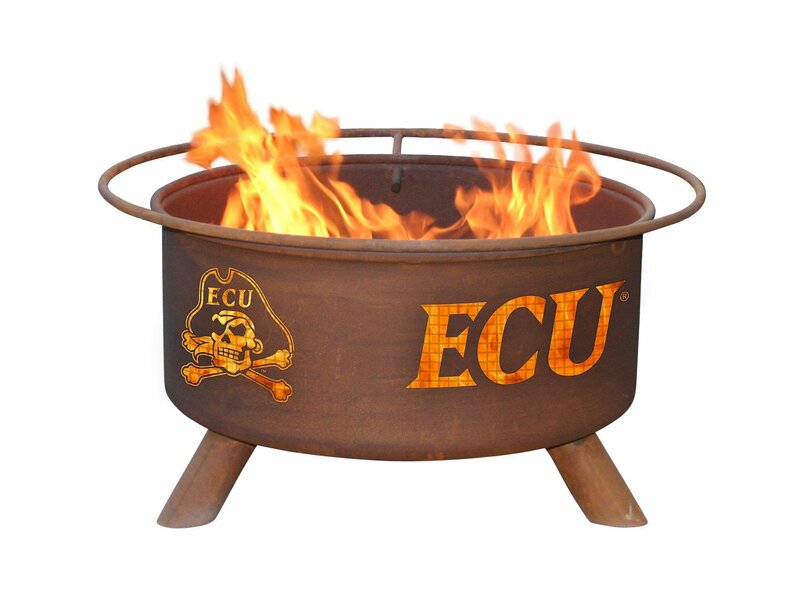 Collegiate fire pits provide a cool and fun way to show school spirit and dedication. They are available for some of the Universities in USA. They may feature school name, logos, and mascot cutouts in the side of the classic fire pit. 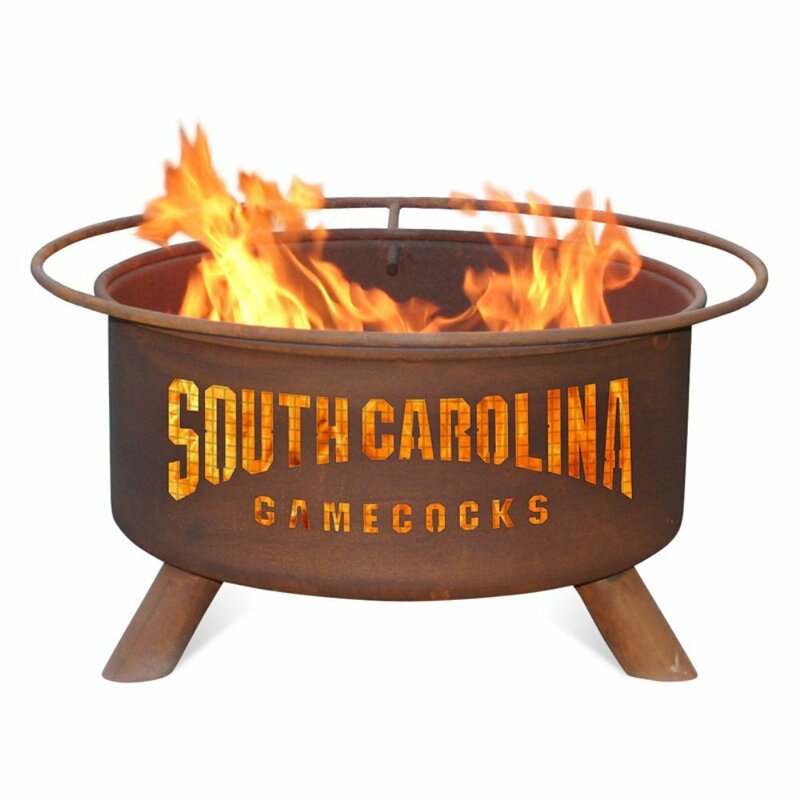 Instead of going for an ordinary fire pit, go for a collegiate fire pit. You can click on any of the pictures above to see if your school is represented. Come with a Five-year warranty. It is guaranteed not to burn through or rust through for five years. 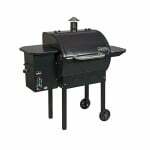 Comes fully assembled for immediate use and also includes a grill and protective cover. 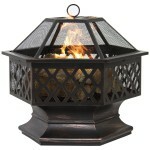 Another heavy duty wood burning fire pit is this Royal Fire Bowl Fire Pit. 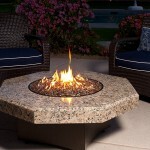 Half shaped sphere fire bowl is set atop a matching pedestal base. It is made of 0.25-inch thick steel and high-temperature black paint, accented with brass highlights. Features two holes in the bottom to allow for drainage, and two 4-inch-diameter handles for easy movement. 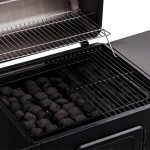 Includes a mesh spark screen, poker to safely remove the spark screen and stoke the fire, and a wood grate. 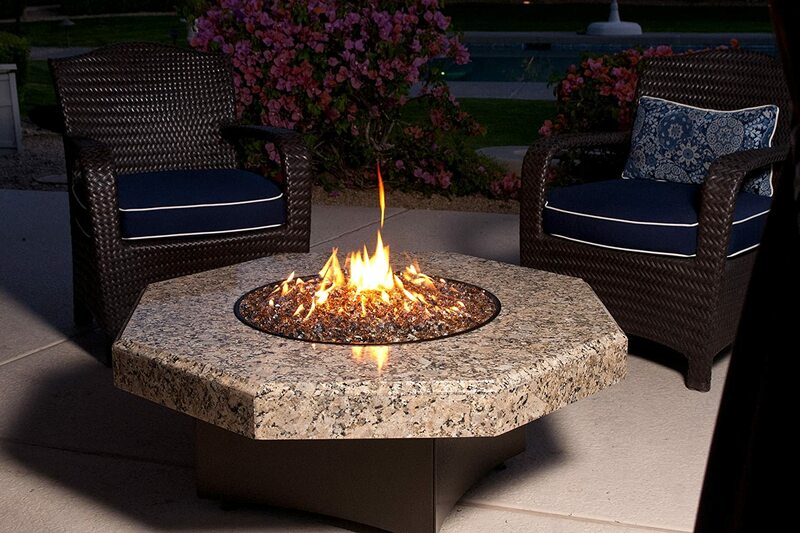 And that concludes our list of the prefect fire pit gift ideas. The above fire pits are simple and most of affordable. However, if you have a little more cash to spare and you’re looking for something more sophisticated and elegant, then the above list will not cut it for you. 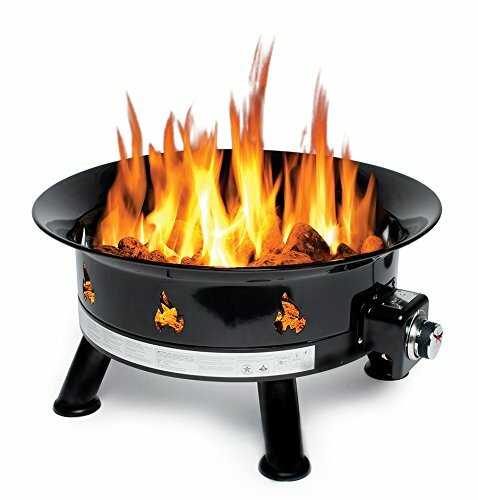 Personally, I think that fire pit tables would be the ideal gift to give someone as compared to just an ordinary fire pit. Fire pit tables along with being able to provide the warmth, they are better equipped to be more functional than ordinary fire pits. Fire pit tables aside from producing warmth, they are used to accent the outdoor living area. They completely transform an outdoor living area by creating a space that is cozy and elegant where friends and family can gather. 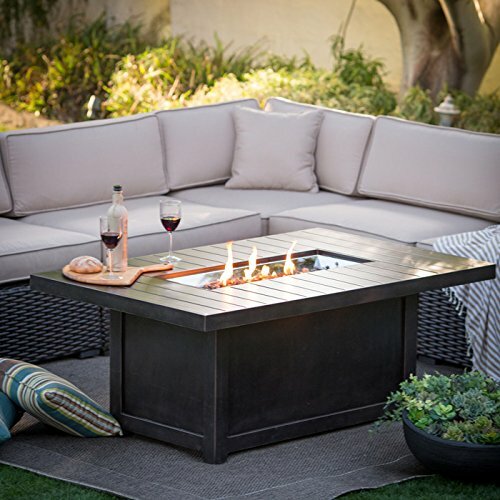 They can also be used as tables thanks to the extra wide rims or even completely transformed into full tables thanks to fire pit lids that are placed on top of the fire burner. They can also be used to complement other outdoor features such as pergolas, gazebos and even swimming pools, creating an outdoor space that is not only unique, but also sophisticated. 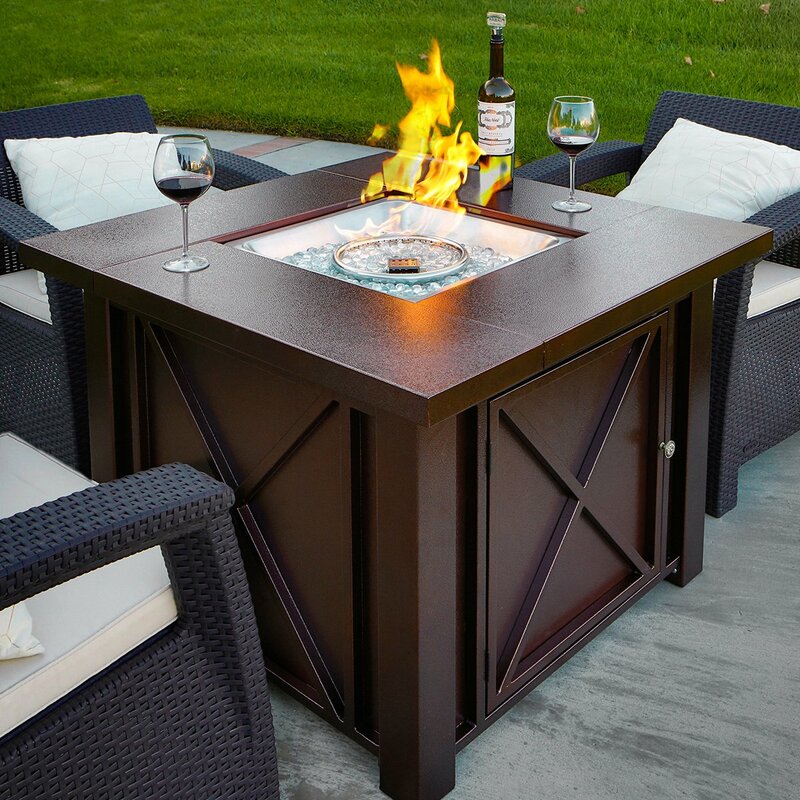 So, if you have the cash to spare, please go for a fire pit table instead because I can assure you, a fire pit table is much more functional and therefore more likely to bring more satisfaction to the person you gift. And you know what the best thing is? There are literally hundreds of designs to choose from and at some affordable prices too, even as low as $200! And this being the shopping season, you can expect to find even lower prices. Just make sure you go for the best rated. 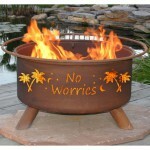 But here, some ideas of what we consider to be perfect propane fire pit table gifts for anyone. 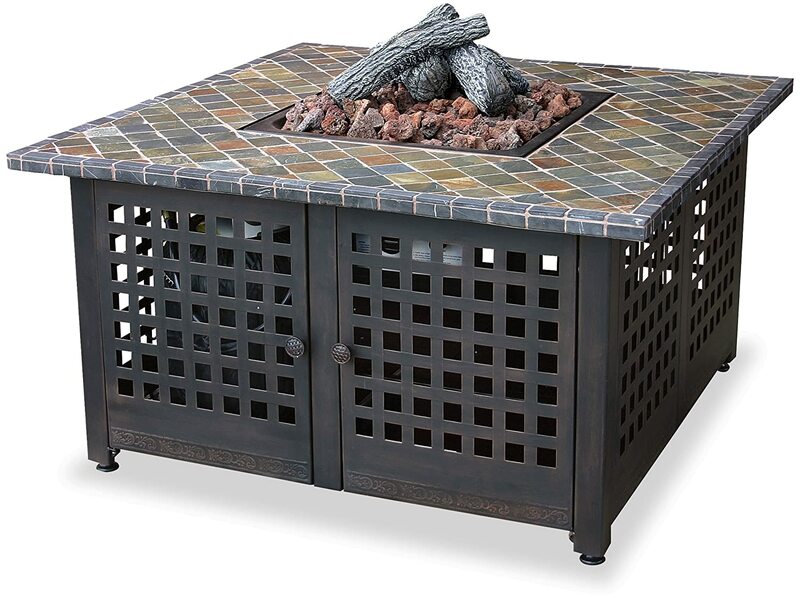 These fire pit tables operate on standard LP propane tanks which are sold separately. The propane tanks are stored in the fire tables behind hinged doors on sides. Our absolute favorite and top recommendation for a perfect fire pit gift idea this holiday season is the Outland Propane Fire Pit Table. Being a product of the Outland Living range of products, you can expect nothing but quality with this one. I mean their portable propane fire pits are best sellers, what do you expect? But you don’t have to take our word for it. Head over to Amazon and check out the raving reviews on this outdoor fire pit table. It is one of the best in the market, so much so that it won the Silver Medal in the 2016 International Design Awards for Best Design in Outdoor Patio Furniture! It’s quite affordable too! Powder coated aluminum frame with 8 mm black tempered glass tabletop and espresso brown resin wicker base. Auto-ignition system for effortless lighting and flame height adjustments. 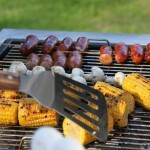 It is CSA approved and safe to use during most fire bans. Comes with a pre-attached 3 ft hose with regulator, type 304 stainless steel fire burner, and 15.5 lb Artic Ice decorative fire glass gems. 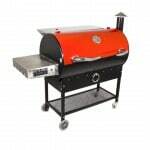 Comes with a 40,000 BTU cast iron burner, lava rocks and logs. Also included is a protective cover. 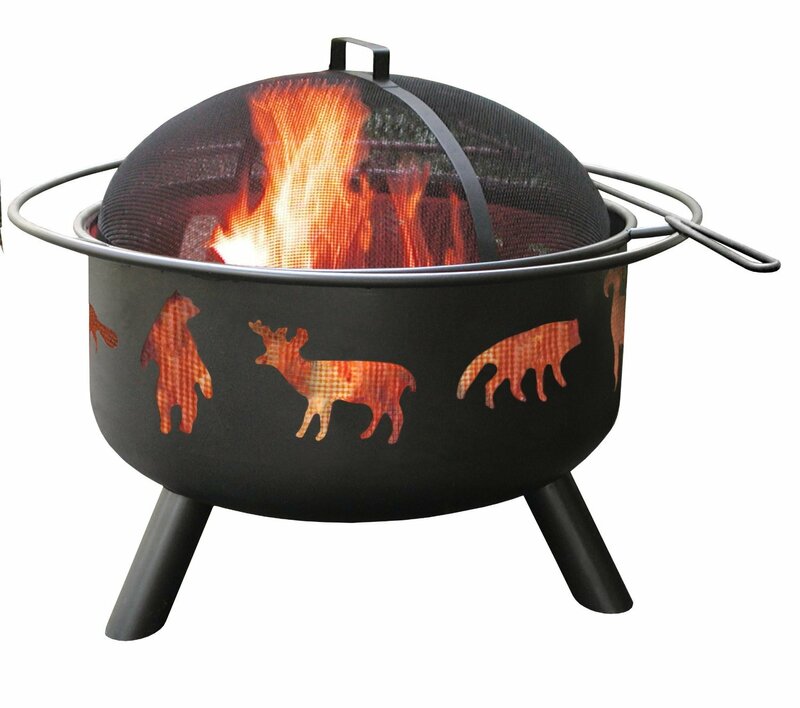 Do we even have to explain why this one is featured in our list of fire pit gift ideas? It’s gorgeous! Just by looking at it you can tell that not only is is unique as it is elegant, but it is a sophisticated fire pit table made with highest regard to quality to ensure years of service. The steel frame of the table has a high quality powder-coated finish of the highest quality to prevent any rusting as well as complement the sophisticated style of the granite top. 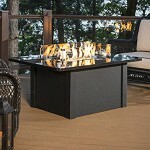 Oriflamme fire table features an attractive Giallo Fiorto granite tabletop with beveled 4 inch edge. 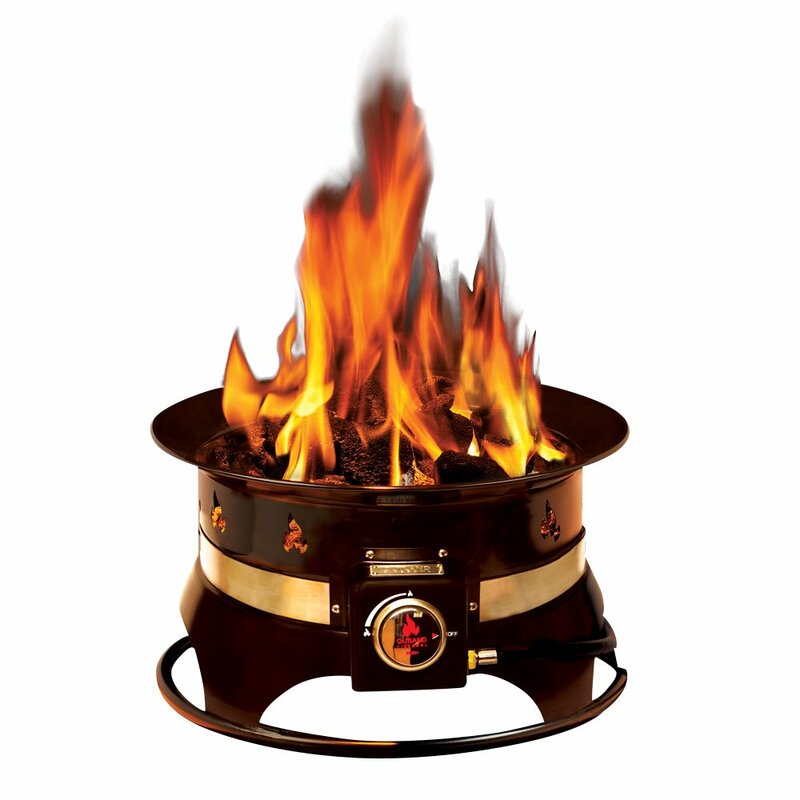 It includes the elegance burner design which means it burns throughout the whole burner as opposed to just through a ring. Features a dual tank system, which allows the fire pit table to hold 2 self contained hidden 20 lb standard tanks for double the burn time. Comes with Urban fire glass and a matching Oriflamme powder-coated steel lid to cover the burner when not in use, thereby converting your fire table into a full table. Also comes with a specialized tool for easily lifting the burner. This table has a high to low control knob on the side of the base for flame adjustments. If you’re looking for a fire table that will make a statement then this one fits the bill. It may be on higher side but worth every penny! Again if you’re looking for something unique and exquisite, then take a look at these beautiful fire tables. They feature a steel frame bowl in powder coating to prevent rusting. 90,000 BTU match-light 304 stainless steel burner. This 90,000 BTU rating is the highest we have seen for a propane fire pit table which means they may be one of the best fire pit tables for heat production making them very ideal and perfect for this winter season. Unlike most fire tables in the market where by the propane tank is accessed through an easy access door on the side, with these ones you access the propane tank by lifting table top. Matching locking cover for the burner and lava rocks included. Highly rated, Napoleon’s St. Tropez rectangular patio flame table would be a perfect addition to any outdoor living space. 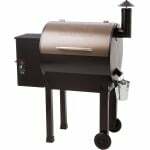 It features a durable rust-resistance aluminum frame with rustic bronze finish. Includes decorative fire glass gems. 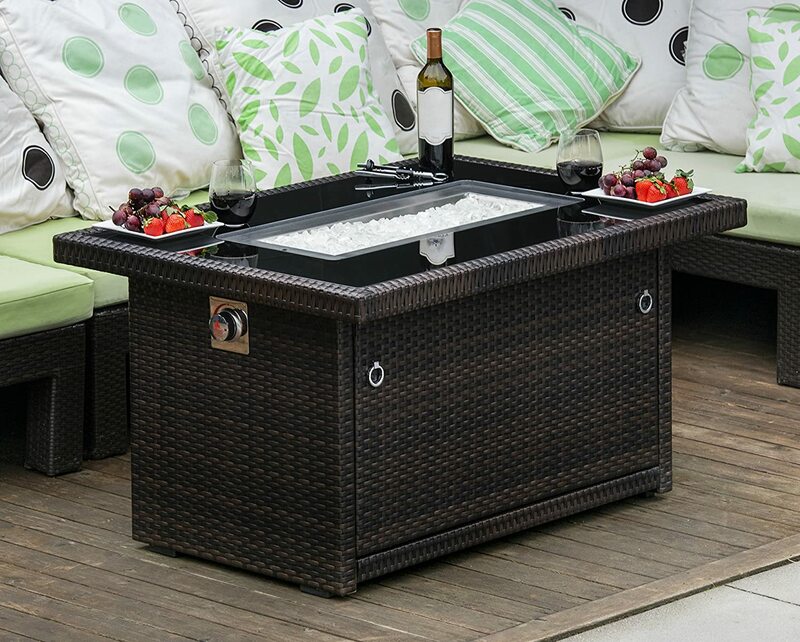 The St. Tropez rectangular patio flame table puts out 60,000 BTU’s of heat. Fitted with thermocouple valve safety feature. It cuts off the gas when the flame is interrupted, preventing gas leaks and wastage. Drainage holes in the stainless steel burner allow rainwater to drain out if exposed to rain. Something unique and stylish for the wine lovers. 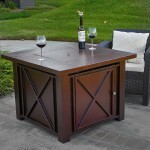 These classic fire pit tables are creatively handcrafted in California using a reclaimed wine barrels. 304 stainless steel burner with 65,000 BTU rating. Comes with a key knob for adjusting the flames. 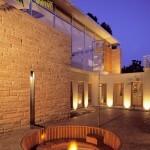 Comes with crystal amber fire pit glass and a protective weather cover. You know what? The clock you see on this fire table is not just for show. The two opposing sides of this modern classic fire table have a working Roman numeral clock, that allows you to watch the hours go by as you enjoy the fire warmth from your fire table. Pretty nice don’t you think? To ensure unobstructed beauty on all sides, the fire table is designed with a lifting table top to allow you to access your propane tank. And that concludes our list of fire pit gift ideas. Are you feeling inspired? 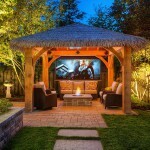 You should be because a fire pit would not only be practical and handy this winter season but also a create tool for accentuating the outdoor living space.